The Murder of Jhon Jairo: Nunca Mas! Working in Colombia with CPT sometimes feels like living in the mythic wild west of the US in 1800s. Justice systems in newly founded towns relied on a limited supply of qualified sheriffs, judges, mayors and city councilmen to adopt and enforce laws. Legal recourse might be left to the hands of vigilantes, or the offender might literally "get away with murder". "Might made right," and the wealthy in town were likely to be the mighty and therefore control who won and lost in the justice system. Here in Colombia there are police, judges, mayors or city councilman, but because the balance of power and wealth is skewed toward a small group of wealthy often supported by the Army and Police it's like the wild west for many in the middle and lower classes. One of the phrases common in areas with this imbalance of power is "No more Impunity!" I heard it again today as I attended the funeral of 19 year old Jhon Jairo de la Rosa. Jhon rode off on his motorcycle Sunday morning May 20, and was found dead in Barranca on Wednesday May 23. The throat of his mutilated body had been slit. When the family went to the Police Office on Monday morning to report their son missing, the police refused to take the information. Officers tell families to wait a bit and their teen will show up- you know how teens are. 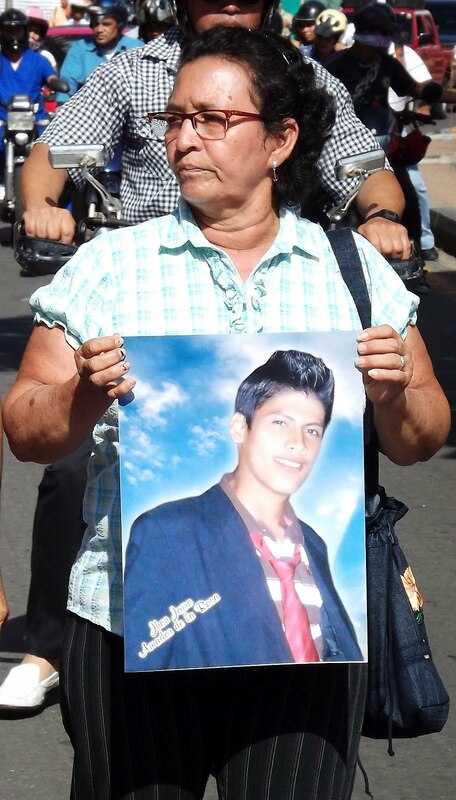 Jhon's family may have been extra vigilant as they lost a family member in a massacre here of young men in 1998 and there have been a string of murders of young people in Barranca over the past decade. Thursday, CPT members accompanied a funeral procession of 140 people marching through downtown with the body of Jhon Jairo chanting, "Nunca Mas! "- ("No More!"). A local Catholic Priest and sister led a litany, songs, prayers and cries for justice. Dozens of teens carried signs and wore headbands with the message, Nunca Mas! The procession stopped in front of both the Justice Department and the City Council Buildings. Under conditions often like the wild west, it makes a difference when international humanitarian workers are present monitoring events and demonstrating solidarity. It sends an important message to the powers in charge that their leadership is being monitored and is inadequate. It sends an even greater message to those who suffer. You are not alone. We stand in solidarity with you.